The U.S. Army deployed its next generation Abrams tank – known as the M1A3 – in combat in 2017. Army officials have said they plan to keep the latest iteration of the long-serving tank in service until 2050. The first Abrams tank – called the M1 – entered service in 1980. It is named after General Creighton Abrams, who served as Commander of U.S. military forces in Vietnam from 1968 to 1972. Two other generations of the Abrams tank have been brought into military service over the past 30 years – the M1A1 and the M1A2. The Abrams tank was used by the U.S. Army in Europe during the late 1980s. The tank was first deployed in combat during the 1991 Gulf War. Nearly 2,000 M1A1 versions of the tank were stationed in Saudi Arabia as part of Operation Desert Storm. The Abrams proved superior in combat to the Soviet-built tanks used by the Iraqi military in that war. After the 1991 Gulf War, the Abrams tank was upgraded to the M1A2 model and deployed to Bosnia and throughout the Middle East. The tank has been effective due to its firing accuracy, strong armored shell, and durability in harsh desert environments. The M1A2 version uses gas turbine engines. In its deployment it was equipped with weapons that included the M256 smoothbore gun, a 50 caliber M2HB machine gun, 7.62-millimeter M240 machine gun, and smoke grenade launchers. Despite all of its achievements, the Abrams has been criticized for its size and weight. With the M1A2 at almost 70 tons, the tank has not been easy to mobilize quickly. It has also been difficult to transport by air into foreign combat zones and is nearly incapable of crossing most bridges. 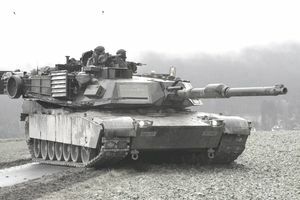 The Army sought to rectify these problems with the new M1A3 version of the Abrams, which is lighter and more maneuverable than previous generations. Congress allocated funding for further upgrades to the Abrams tank in 2014, directing roughly $120 million for investment. The newest, M1A3 Abrams is outfitted with a number of enhancements over previous versions. To make it lighter and more mobile, the Army replaced the M256 smoothbore gun with a lighter 120-millimeter cannon, added road wheels and an improved suspension system, installed a more durable track, used lighter armor, improved idle mode efficiency, and inserted precision armaments capable of hitting targets from 12 kilometers. Additionally, the tank is also outfitted with infrared cameras and laser detectors. These upgrades enhanced the Abrams tank’s design features and make the tank more effective in armored ground warfare and urban environments. The Army had announced plans to retire the Abrams tank and replace it with the XM1202 Mounted Combat System, a more compact and lightweight tank, but the Department of Defense canceled the program in April 2009 during a round of budget cuts.